U.S. Defense Secretary Jim Mattis will be leaving President Donald J. Trump’s cabinet effective January 1 despite his announced resignation date of February 28. On Sunday, Trump announced via Twitter that Mattis would leave office two months earlier than anticipated and be replaced by Patrick Shanahan, the current deputy secretary of defense, upon his departure. 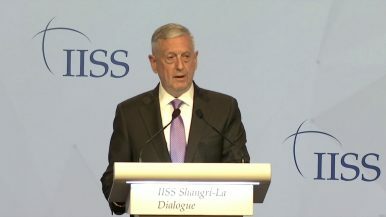 “The end date for my tenure is February 28, 2019, a date that should allow sufficient time for a successor to be nominated and confirmed as well as to make sure the Department’s interests are properly articulated and protected at upcoming events to include Congressional posture hearings and the NATO Defense Ministerial meeting in February,” Mattis had written in a widely circulated resignation letter that underlined his fundamental disagreements with Trump on the appropriate overseas role for the United States. Mattis’ departure on January 1 will mark the departure of one of Trump’s most notable inaugural cabinet appointments. Mattis’ resignation letter was delivered shortly after Trump’s decision to announce a unilateral U.S. withdrawal from Syria and a decision to also leave the 1987 Intermediate-Range Nuclear Forces Treaty. Brett McGurk, the U.S. envoy to the international coalition combating the Islamic State in Iraq and Syria, resigned shortly after Mattis’ decision. Mattis’ letter in particular emphasized the important role that U.S. alliances play in U.S. national security. His resignation comes ahead of the slated expiration deadline of the U.S.-South Korea Special Measures Agreement, the bilateral allied agreement that governs burden-sharing. 'Sanctions Are Coming': US Issues Limited Iran Sanctions Waivers, With One Big ExceptionIs the US-South Korea Alliance in Trouble?US, South Korea to Negotiate Alliance Cost-SharingWith an Eye on Great Power Conflict, US Defense Department Releases 2018 National Defense StrategyAs Inter-Korean Talks Convene Regarding the Olympics, What Is the Scope for Broader Korean Peninsula Diplomacy?